May reduce blood glucose levels in people with diabetes. May reduce body weight and blood triglyceride levels. The ayurvedic herb Gymnema sylvestre is used in traditional medicine to control blood sugar levels and curb carbohydrate cravings (uncontrollable urges for sugary products). In one study, Gymnema supplementation reduced glucose excretion in urine and blood sugar in 85% of insulin-dependent (type 1) diabetics (Shanmugasundaram, ERB, et al “Use of Gymnema sylvestre leaf extract in the control of blood glucose in insulin dependent diabetes mellitus” Journal of Ethnopharmacology 30: 281-294, 1990). In another study, Gymnema lowered fasting blood glucose levels and the insulin requirements of type I diabetics without causing hypoglycaemia in non-diabetic controls. After two weeks' supplementation, Gymnema also significantly reduced postprandial glycaemia (after a meal) and levels of glycated haemoglobin (a marker of glycation levels caused by excess blood sugar). Gymnema also decreased the level of medication needed to control blood sugar in type II (non-insulin dependent) diabetics. Even more significantly, Gymnema sylvestre improves the functionality, and seems to increase the number, of insulin-producing bêta cells in the pancreas. It's the only known substance to have such a regenerating effect, making it the product of choice for regulating glucose metabolism. 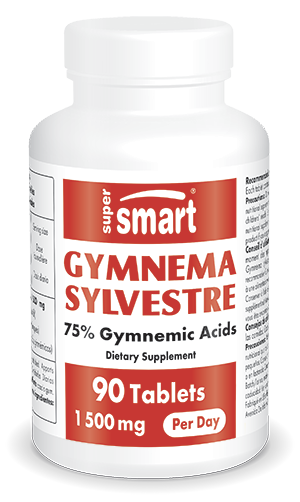 Each tablet contains 500 mg Gymnema sylvestre extract standardized to contain 75% gymnemic acids. Take one to three tablets a day, at mealtimes, as required or as advised by your therapist.